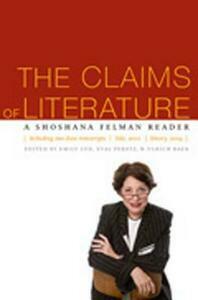 Shoshana Felman ranks as one of the most influential literary critics of the past five decades. Her work has inspired and shaped such divergent fields as psychoanalytic criticism, deconstruction, speech-act theory and performance studies, feminist and gender studies, trauma studies, and critical legal studies. Shoshana Felman has not only influenced these fields: her work has opened channels of communication between them. In all of her work Felman charts a way for literary critics to address the ways in which texts have real effects in the world and how our quest for meaning is transformed in the encounter with the texts that hold such a promise. The present collection gathers the most exemplary and influential essays from Felman's oeuvre, including articles previously untranslated into English. The Claims of Literature also includes responses to Felman's work by leading contemporary theorists, including Stanley Cavell, Judith Butler, Julia Kristeva, Cathy Caruth, Juliet Mitchell, Winfried Menninghaus, and Austin Sarat. It concludes with a section on Felman as a teacher, giving transcripts of two of her classes, one at Yale in September 2001, the other at Emory in December 2004.